Ionic Men's Scrub Jacket —New! 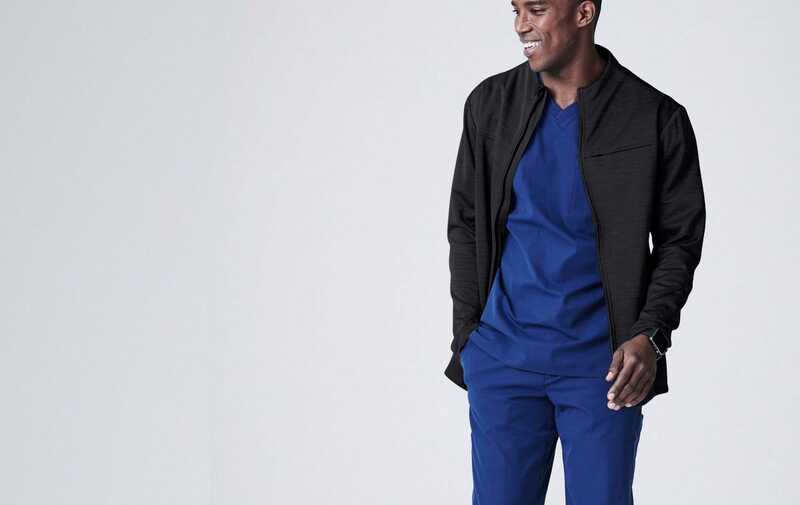 Sporty and innovative, the Ionic Jacket offers a uniquely modern aesthetic. Its multiple hidden pockets and custom badge holder are sure to make even your busiest days seem like a breeze. On-seam chest zipper pocket, 2 large interior pockets, and a media port above a hidden phone pocket. 3 zip-up security pockets at the waist, 2 pen pockets on forearm. Breathable, bacteriostatic, water repellent, moisture-wicking fabric with mesh back panel. Could not have asked for anything better! Being new to the medical field, I was very skeptical as to how medical clothing was supposed to fit and feel. I have been thoroughly impressed with the jacket and I keep getting compliments on it. Had a problem with the initial order and they replaced it no questions asked. I have been very impressed with my Ionic Scrub Jacket. It is a tiny bit long, but that is not a criticism. It means it won’t expose your belly every time you reach for something. (Oh, and the sleeves are just right for my slightly-linger-than-normal arms) The moisture repellent nature of the fabric has already been helpful, and it takes the chill out when I’m circulating in the OR. I personally like the shoulder badge location, which keeps my ID out of the way when I am prepping the patient. And bonus? It has gotten a lot of compliments from my coworkers, liking the sleeve pen holders and the overall look. I kind of want to get another just to wear outside of the hospital! I love this jacket so much first and foremost because of the utility it provides with all the pocket real estate. It’s got the left chest pocket that can remain zipped if you choose and keeps a discreet look, and two side pockets with a pouch in the right pocket that fits my iPhone 7s plus comfortably. I really enjoy the two pen slots on the left forearm sleeve for easy access to pens, though it does take a little getting used to and you have to use regular size pens with non “sticky” grips. So for that meant no pilot Dr. Grip, but thats just fine. 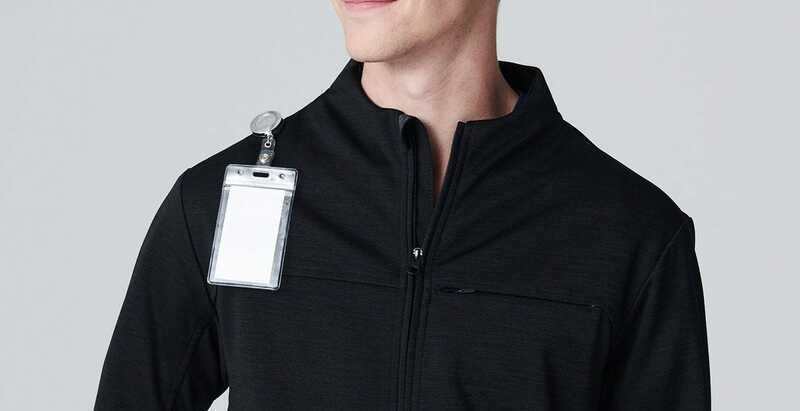 The hidden badge slot on the right shoulder is also a nice touch, especially since my hospital has a policy stating your badge has to be somewhere at torso level, it complies with the rule and keeps it out of my way. Just be careful with wearing backpacks if you’re actively utilizing the slot or you could damage your badge or it could dig into your shoulder. Just have to be smart. It’s also got two large discreet pockets in the inside of the jacket but I never really use but are there just in case. Best of all, if you are switching to a non scrub business casual environment, the jacket still looks great in that situation, as well as a straight casual environment, I get compliments all the time about it. The jacket is thick enough to be warm in cold weather. I am comfortable with just the jacket in 40 degree weather without layering, but it is still breathable and doesn’t become stifling when wearing it in warmer weather, though I would not recommend it in hot weather. Finally, the fit of the jacket itself is a dream and is nice trim and tailored looking keeping you looking your best and is extremely durable. I definitely recommend this jacket to all of my peers. I do wish the grey was a shade or two darker, as I prefer more charcoal grey, but the grey still looks great over darker grey and has definitely grown on me. feels good when wearing it. Jacket is a great fit! Fits great and stylish too. Plenty of compliments. Looks sporty but still very professional. Clean cut, comfortable, well manufactured and with plenty of pockets. Not very warm, but enough to cut the chill in the ED at night. At first I was a little bit disappointed because it runs a little bit too large, but honestly it looks amazing and it’s super comfortable!! I get compliments on it all day. It’s also very convenient with all its pockets.